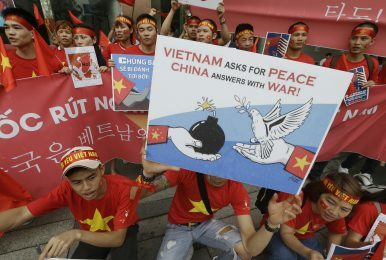 Vietnamese protesters shout slogans while showing an anti-China protest placard during a rally against China near the Chinese Embassy in Seoul, South Korea (July 24, 2016). The visit to Vietnam by the U.S. Navy aircraft carrier Carl Vinson on March 5 is symbolic on multiple fronts. It is the first such port call to Vietnam by an American aircraft carrier since the end of the war in 1975. Plus Da Nang, where the port call took place, was also the site of the initial U.S. Marine Corps landings on March 8, 1965. Finally, as some commentators have pointed out, the move symbolizes the increasingly closer relations between Vietnam and the United States on the defense and security front, especially following the earlier decision by Washington to lift the decades-old arms embargo on Hanoi. Whether this latest visit would once and for all exorcise the ghosts of the Vietnam War — a protracted, bloody conflict that inflicted grievous losses on both sides in blood, sweat and treasure — remains to be seen. But both capitals have been optimistic about the long-term trajectory of this budding bilateral relationship, which has been carefully cultivated since the end of the Cold War. That coincided back then with Hanoi’s recalibrated foreign policy, which favors independence and nonalignment/alliance, instead embracing a more outward-looking posture aimed at promoting regional economic integration, which serves the domestic agenda of “Doi Moi” (Renovation) socioeconomic development process that still continues today. Another observation about the Carl Vinson visit is that it took place just about a week before the 30th anniversary of the Battle of the Johnson South Reef on March 14, 1988. This episode, along with the earlier Battle of the Paracel Islands in 1974, which was fought between South Vietnam and China, would not have been unknown to Vietnamese military planners. These two battles saw the tactical and strategic defeat of Vietnamese forces at Chinese hands – Beijing cinched the prizes of occupying the concerned features to this day and did so at a fraction of the losses inflicted upon Vietnam. Hanoi certainly harbors no illusions about a future naval skirmish with Beijing. Both ruffled each other over the Chinese oil rig HYSY-981 in 2014, in an almost two-month-long standoff off the Paracels. Though China subsequently removed the platform, which thus could be painted as a victory for Hanoi, the lessons were hard won. That episode fortuitously did not escalate into a full-blown shooting clash similar to the 1988 event, but Vietnamese forces were exhausted by the grueling showdown. Ultimately, an asymmetry in materiel and manpower between the maritime forces of the two rivals was just too huge. In a future standoff with China, Vietnam would first have to contend with China’s maritime militia and coast guard on the frontlines. But it is the People’s Liberation Army Navy, which lurks in the shadows ready to leap forward to back up its paramilitary counterparts, that is of most concern. The 1988 battle saw the PLA Navy deploy three frigates – Nanchong, Xiangtan, and Yingtan – pitted against landing craft and troop transports of the Vietnam People’s Navy. The results were thus preordained. No way could these lumbering, lightly armed vessels would fare well against the fast and heavily armed Chinese warships. The Vietnamese lost three ships and more than 60 men in the short, but sharp battle. China is not doubt looming large at the back of the minds of the leaders in Hanoi and Washington as they reach out to each other. Hanoi has made no bones about its sense of unease regarding Beijing’s growing material might and in parallel, its increasing assertiveness. This is evident with China’s continued militarization of its artificial islands in the South China Sea at the same time it is putting up “smile diplomacy” outreach to ASEAN and calling for cooperation, including an agreement to begin formal negotiations on the proposed Code of Conduct. Vietnam’s concerns about the future of the disputes were further heightened after the ruling Chinese Communist Party proposed sweeping reforms to the Chinese Constitution, including the removal of clauses mandating that the president would serve no more than two terms in office – thus creating the prospect of Xi Jinping holding onto power for perpetuity. One needs no reminder that China’s muscle flexing in recent years took place under Xi’s watch. This can only mean the possible likelihood of “business as usual” – and even a worsening of future scenarios in the South China Sea – under a protracted Xi rule. The current Sino-ASEAN concord over the disputes is far from assured, and could take an abrupt turn downhill at any point of time. What appears to remain constant is Beijing’s incessant buildup in and around the disputed Paracel and Spratly Island groups. While the “black box” of Chinese policy elites’ true intentions is always murky, those sprawling bases on the fake islands are an undeniable fact – clear as crystal. Therefore, the Carl Vinson visit is indeed opportune. This ought to be taken as a concerted series of measures by Hanoi to send a serious signal to its vastly more powerful neighbor up north. Just before the carrier visit took place, Vietnamese President Tran Dai Quang called on New Delhi, one of Hanoi’s closest partners. During the visit, both countries agreed to work together to build “an independent, open and prosperous Indo-Pacific region” – which seems to bear strong resonance to the “Free and Open Indo-Pacific” concept championed by Japan, another of Vietnam’s closest partners. In recent years, more and more foreign naval ships have visited Vietnam’s ports. Before the visit of USS Carl Vinson, numerous Arleigh Burke-class guided-missile destroyers visited Vietnames ports. Australian, Indian, and Japanese gunboats also made port calls in Vietnam; notably, last year, the helicopter destroyer JS Izumo (DDH-183) visited Vietnam in its first overseas voyage. While China builds more aircraft carriers, Japan had planned to convert the Izumo-class into true aircraft carriers, which could even bring F-35B fighters to combat. So Izumo’s trip in the South China Sea appeared to signal a challenge to China. Last year, Australia sent the HMAS Ballarat, an Anzac-class guided missile frigate to visit Da Nang. In September 2017, the Indian Navy’s stealth frigate INS Satpura (F48) and the anti-submarine warfare corvette INS Kadmatt (P29), carrying a total of 645 officers, visited Hai Phong city. It is noteworthy that these port calls were conducted by the four members of the revived quadrilateral security cooperation framework, the so-called diamond alliance. Together, their warships have made their presence known in the South China Sea, a bridge to connect the Indian and Pacific Oceans. Despite all the diplomatic niceties one could observe taking place since the ASEAN summit in August last year, the risk of future conflict in the South China Sea endures. While the prospect of promulgating a Code of Conduct remains uncertain at best, Hanoi appears certainly to be preparing for the worst. The 1974 and 1988 battles serve as a warnings from history. Yet the geopolitical context is much different; thus according Hanoi a much wider range of strategic options in terms of ties and weapons. Where ties are concerned, the post-Cold War foreign policy recalibration gives Vietnam a hitherto never-before-seen berth of avenues with diverse countries. Of course, Hanoi has strived to maintain its traditional friendships with former communist-bloc nations, primarily Russia. However, it has also managed to cultivate closer ties with the West. In the immediate Southeast Asian region, Vietnam no longer stands out like a “Soviet client” sore thumb, but has been fully accepted as a member of ASEAN and over the decades proven to be an avid advocate of the regional bloc and its ideals for a regional security architecture, which envisages an inclusive approach toward roping in surrounding powers like Australia, India, Japan, and the United States to own a veritable stake in Asian peace and stability. The post-Cold War environment to this day also opens up to Vietnam another valuable avenue for its defense capacity-building. While it continues to incline toward Russia for the bulk of its “big ticket” military items, Vietnam has availed itself of other sources such as Israel, the Netherlands, and Sweden for niche capabilities. In the current context, Hanoi needs more time to eventually wean itself off its heavy reliance on Russian weapons, with the attendant risks of being cut off from supplies in times of a conflict with China due to the stronger Sino-Russian strategic ties following the Ukraine crisis in 2014. To date, through this approach of gradually diversifying its arms sources, Vietnam has been able to build a more robust military, including a navy that is unlike its predecessor in 1988. Notwithstanding the vastly different strategic context Vietnam finds itself situated in today, there is no room for complacency. Vietnam should expect to fight China again if push ever comes to shove. Entertaining this prospect is not far-fetched, if one takes it seriously Beijing’s threat in August 2017 to attack Vietnamese forces in disputed waters unless Hanoi were to demand that the Spanish energy firm Repsol stand down from its work in an offshore hydrocarbon block claimed also by China. Hanoi did capitulate eventually, and Repsol stood down. But clearly, Vietnam does not wish to appear weak in front of China. Credibility is at stake, with both domestic and external repercussions for the ruling elite in Hanoi. And by now, after seeing the way ASEAN intramural dynamics play out over many years on the South China Sea disputes, Hanoi would have reached the dire conclusion that the bloc, if there is ever going to be an outright shooting war with China, would not offer a united stance except perhaps to issue an obligatory statement calling upon all sides to cease fighting and negotiate a settlement. Some of the individual ASEAN member states may even overtly take Beijing’s side, or just stay neutral. At best Vietnam could rely on ASEAN as a bedrock for postconflict economic recovery, even though such a prospect is still far from certain considering the bloc’s economic interdependence with China and possible economic retaliation by the latter. It is most likely that Vietnam would receive support from multiple major powers in times of a war with China over the South China Sea flashpoint, but not direct military intervention, especially if Beijing elects to keep the clashes localized and well contained to avoid provoking an overwhelming international response. As such, Hanoi could expect those friendly extraregional powers to cheer for it, or at best offer diplomatic condemnation against Beijing, and possibly some form of materiel and technical aid for its fighting efforts. But not more than that. If that fateful day eventually come, will the United States flex its muscles with a carrier strike group somewhere close to Chinese shores or near the scene of battle, and will that make any difference to the outcome? Perhaps, but nobody can be sure. Koh Swee Lean Collin is research fellow with the Maritime Security Programme, at the S. Rajaratnam School of International Studies, Nanyang Technological University, Singapore. Ngo Minh Tri conducts research on international security affairs, and is a managing editor of ThanhNien newspaper in Vietnam.